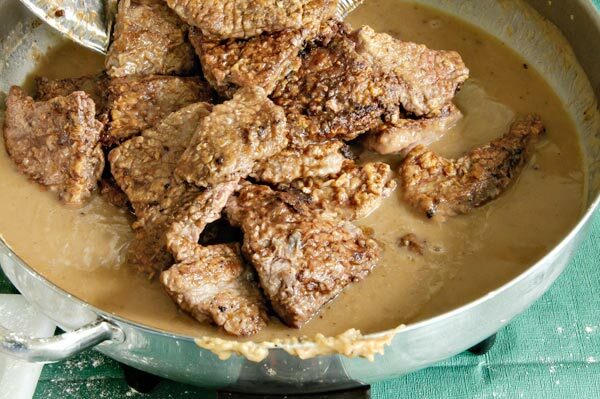 Rich, beefy smothered steak is comfort food, with a long simmering time. It’s Friday food here at the farm, as long as there’s round steak in the freezer, although we’ll make an exception and serve to guests on other days if the guests are special enough. Warning! This is not a low calorie, diet friendly dish. 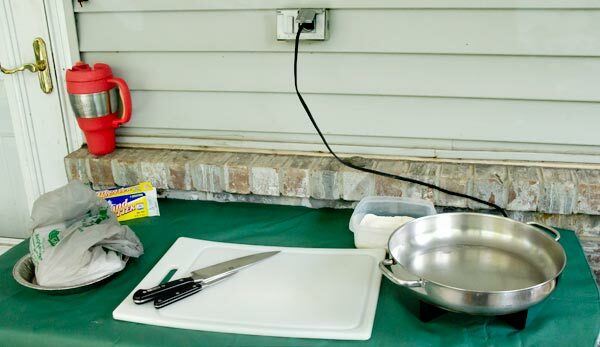 Usually I prepare it in a big skillet on the kitchen stove, but when I don’t want to heat up the kitchen by having a burner going for three hours or so, I move to the front porch where I can set up the electric skillet on a sturdy table. I wasn’t kidding about the three hours part. 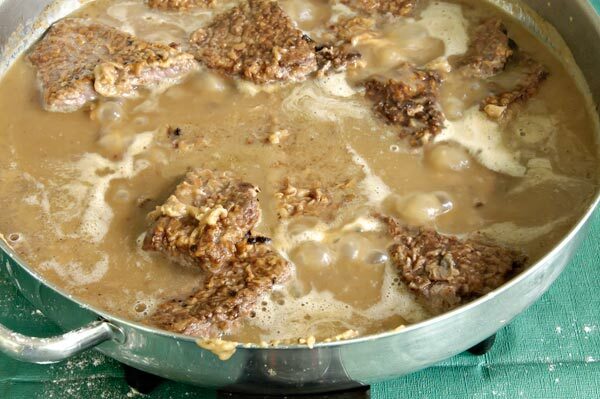 Since it’s generally made from a cheaper cut of beef, good smothered steak requires a quick browning, then a long, low simmer to reach that juicy, fork-tender state. 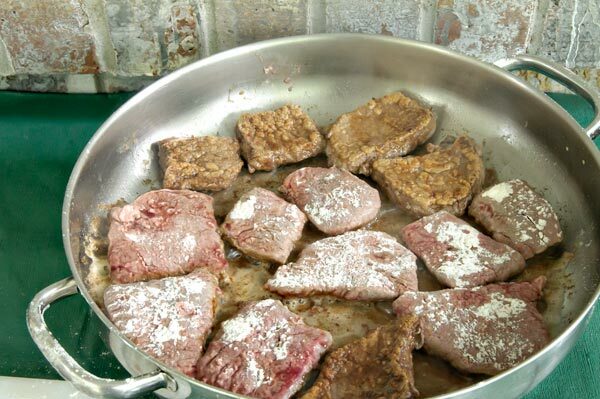 While the butter’s melting, cut the round steak into sections, removing as much as the fat and connective tissue as you can. I start by cutting out the bone (and tossing it to the most deserving dog). 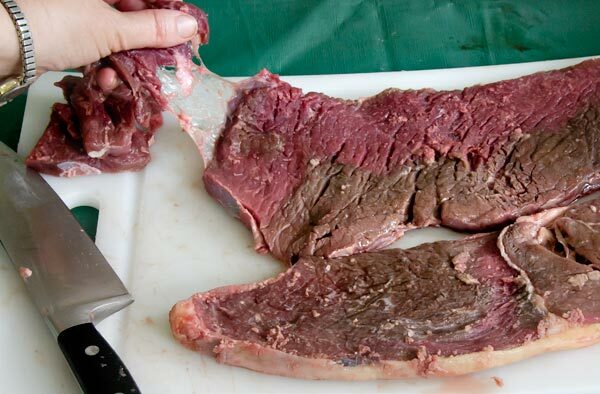 Then I separate the round steak along the natural dividing lines in the meat, cutting out the tougher connective tissue as I go. Sometimes I leave the sections large enough for single servings, and sometimes I divide those into halves or thirds. It depends on what I’ll be serving with the smothered steak, how it’ll look on the plate, and what I’m in the mood to do. Add salt and pepper to taste to about a cup of flour — garlic, too, if you like — then generously coat the meat with the mixture. 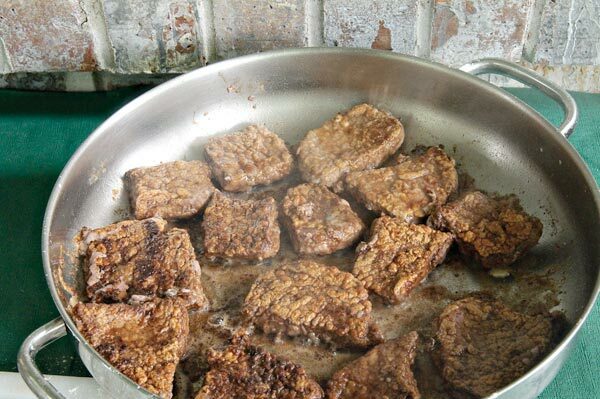 When the butter’s sizzling hot, place the floured meat in the skillet to brown. 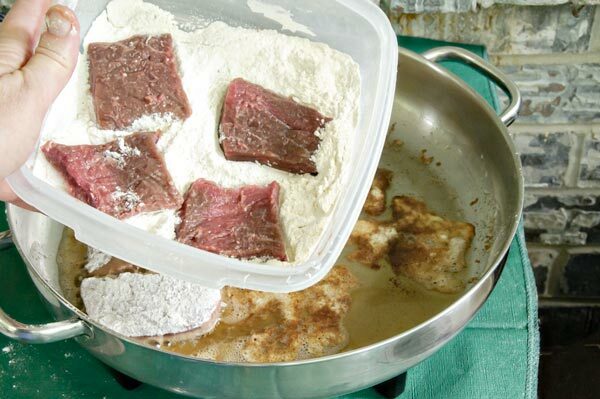 The floured portion has a tendency to stick, so use a metal spatula and scrape under the meat carefully when you turn it. I can usually tell when the first side’s about done because the meat juices will have soaked through most of the flour that’s stuck to the uncooked top. 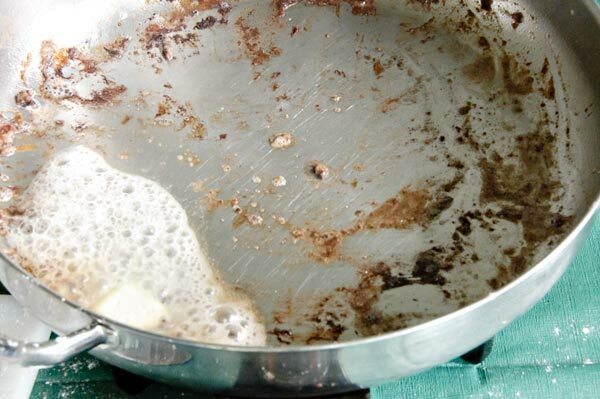 Note – you might need to lightly grease the skillet when you turn each piece if there’s not enough butter or oil left to sear and sizzle the uncooked side. Remove each piece when both sides are browned but not thoroughly cooked. The meat should still be oozing pink juices at this point. This next stage is optional. 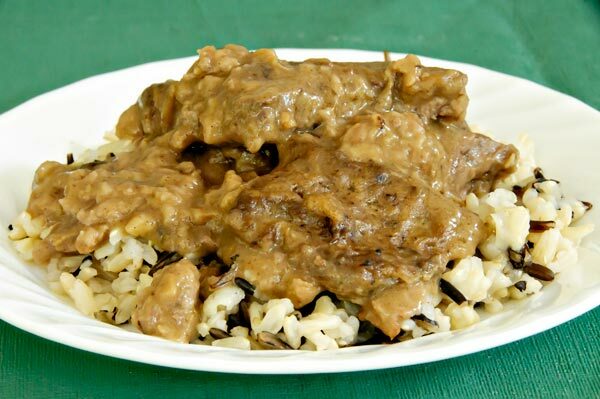 I like a bit more sauce with the smothered steak, so prepare a roux for a gravy base at this point. 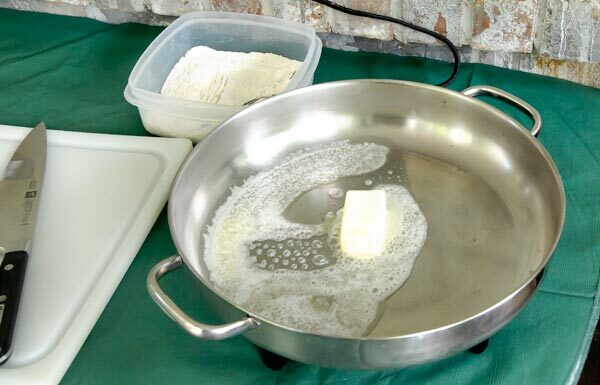 To do this, melt another chunk of butter, maybe 2 tablespoons. Add an equal amount of flour, stir together, and let cook until the mixture bubbles nicely. 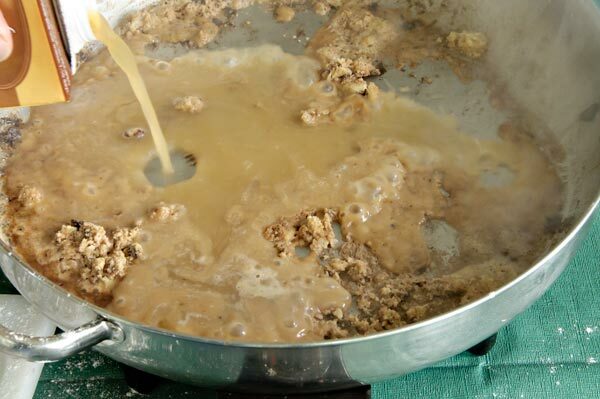 Slowly add beef broth (or water), and stir until a smooth thin gravy forms. Turn the heat down to a very low simmer. Cook covered for at least an hour, although two hours or even more is better. The goal is a long, slow cooking time to tenderize all those tough muscle fibers and whatever connective tissue couldn’t easily be cut out. 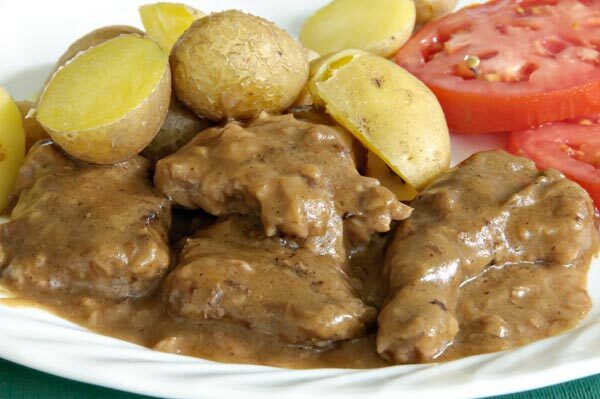 Serve with gravy or drippings over noodles, rice, or with just a couple of side dishes. On hot summer days, I like smothered steak with newly dug yellow flesh potatoes and garden fresh tomato slices. Other times, I like it better with rice or noodles. It’s not half bad straight out of the fridge at midnight either — that’s assuming any leftovers make it into the refrigerator. Don’t you just love those Bubba Keg cups? I have several and I fill it up with ice every morning prior to leaving for work and it still have ice that evening! Pam – YES! And those bright colors are wonderful for those ‘where did I leave my drink’ moments. I was so glad when a local store started carrying the fat-bottomed ones, too. Love those for hauling around to wherever I’m working on the farm.